Few summer veggies or fruits grab my attention like a sun-ripened, freshly picked tomato. There is such a range of flavors in the different breeds of tomatoes – sweet, sour, bitter and umami. Ugly or pretty, yellow, orange, purplish, or red, small or large – I don't care. I just want them grown in nutritious soil, exposed to plenty of sun and picked ripe. I want that tomato to sing in my mouth. Not all raw supermarket tomatoes are tasteless, but many are. To ensure a texture sturdy enough to withstand the rigors of trucking, large farms use breeds that are physically hardy and then pick them while they are green. Exposure to ethylene gas turns their color to a more ripe-like looking orange/red. These tomatoes are then trucked so that they arrive to their destination all dressed up and ready to party. To me, these attractively shaped and colored tomatoes are like manikins – they look good but they don't taste "real." There is not much flavor that I can detect other than a somewhat sour flavor. I often don't buy tomatoes outside of my region's growing season because they are such a disappointment. If you love tomatoes but don't grow your own, then start shopping at your local Farmers Market. It is worth the time – the tomatoes will be freshly picked and truly vine-ripened (and typically organic). As well, you will be supporting your local small farms. If you have questions about how the tomato is grown or harvested, then you can typically ask the owner – he or she is typically working the farm as well as selling at the market. Can't get to the Farmers Market due to work or transportation issues? Then find out about your local CSA (Community Supported Agriculture) - many will deliver to your doorstep. If you want to start growing your own tomatoes but have no land, then consider container gardening or participating in your local community garden. Search your city or town's website for more information about locally funded or supported gardens. If your community has no garden, then consider starting your own. Here's a website to help you get started. In addition to fresh, nutritious, low-cost food, you will also get exercise by cultivating your own garden. Regardless of source, tomatoes are nutritious and contain very few calories. They are a good source of potassium, and vitamins A and C. When concentrated (as in tomato paste or sauce), tomatoes are also very high in lycopene, a carotenoid pigment that colors the tomato and acts as a potent antioxidant. 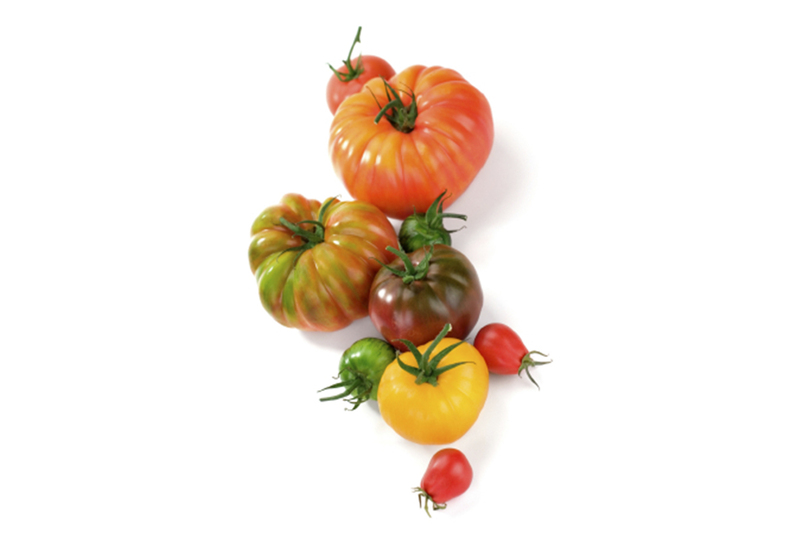 Despite the sweetness of some breeds, all tomatoes are low in carbohydrates (starches and sugars). However, if you have diabetes and juice your tomatoes, then count 12 fl oz (about 11/2 cups) as 1 carb choice or 15 grams of total carbohydrates. Did anyone listen to NPR's Fresh Air show, "How Industrial Farming ‘Destroyed' the Tasty Tomato"? I cannot vouch for the accuracy of this report, but as a general rule, I find NPR's reporting to be accurate on other topics. At any rate, it made me start thinking about tomatoes in the same way that I do about cocoa and coffee- at what human cost am I getting this store-bought tomato? Buying from local farmers allows me to discover under what conditions the tomato is grown and harvested. Potassium – Yet Another Reason to Eat Your Fruits & Veggies! Why is my potassium and other minerals so low?